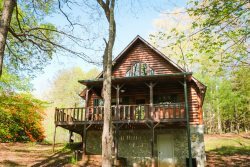 Dances With Wolves is a beautiful pet-friendly cabin located in Morganton GA near Blue Ridge. This cabin sleeps 10 with 3 bedrooms and 3 bathrooms. Everyone was so nice. It was a pleasure working with Tracy. My nieces car needed a jump and the request for help was outstanding. Awesome Team! !